Were there any Dragon cards in Zendikar? I can't think of any. But this proves that there most certainly are Dragons ON Zendikar. And right decent ones at that. It definitely wants to be put in a monored deck, what with the triple-red casting cost and the firebreathing. But the things it can do for you there! We all know monored decks are typically full of burn and aggro, and they typically tend to run out of cards in hand by turn six. So then you drop Mordant Dragon. 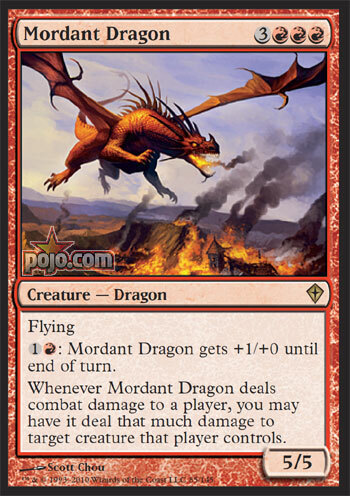 And Mordant's firebreathing means you don't care that you're out of cards-- you've got plenty to spend your mana on! But that's all forgetting that last ability. If Mordant swings and hits your opponent, he then hits a creature of your choice just as hard! So your opponent can throw a creature in its way, or take the damage and let you choose which creature he loses. Why would anyone ever choose to take the damage in that scenario? Well, because Mordant Dragon, like most Dragons, has flying! Your opponent will likely find he has no creatures that can block the Dragon, much less block and kill it. So as your ground army and his stare across the abyss at each other, Mordant Dragon will swoop in and pick off your opponents' creatures one by one, eventually breaking through the defense so all your guys can charge in-- assuming you haven't killed your opponent by then. mordant, adj. 1. sarcastic: sharply sarcastic or scathingly critical. 2. corrosive: having a corrosive effect. Nearly every culture since the beginning of time has been fascinated by dragons, so expectations are very high for any Magic card portraying one, nearly as high as a card with "lotus" in its name. Does Mordant Dragon meet those expectations? I think it does: whether you're admiring its sleek limbs and powerful wings, or removing creatures from the battlefield and players from the game with its abilities, everything about this card screams power, chaos, and glory, minus the brimstone smell that sticks in your clothes. Constructed: Another Dragon to watch and see if it makes some high level constructed play. Few Dragons has made the big shows, but they were the win condition for most decks. Like Predator Dragon for elves and Broodmate for 5-color control, they have a nice nich to fit into. We will see. Casual & Multiplayer: Everybody loves Dragons. I think they are just a popular as Angels. But I believe the get played in more casual decks than any other creature type out there just for fun and flavor. Limited: This is two to three cards all in one for sealed or draft. You have your basic flying and creature removal all in one package, plus Firebreathing. This shows up and unless you have pro-red or shroud than as your life goes down so does you army of dudes. Overall it is good to see a Dragon with more flavor. You would expect a Dragon's breath weapon hit multi-targets. And this one does. A great card to review for Worldwake. Welcome back readers our exclusive card of the day today is the powerful Mordant Dragon from Worldwake. For six mana you get a regular dragon body, 5/5 with flying, the added abilities are always where it’s at. When Mordant Dragon deals combat damage to a player you may have it deal that much damage to a creature that player controls. This ability is powerful especially in conjunction with the firebreathing ability to grant it +1/+0 until end of turn for 1R. Wow, a powerful dragon that can not only take out pesky creature’s opponents control but provides the opponent an incentive to block when able with their own evasive creatures. In standard, extended, and eternal formats I doubt this card will see much if any play at all. Its mana intensive and most Dragons only see play for their combo potential. The only place I see this card is in Hypergenesis but the have such a wide variety of creatures I doubt it would make it, although taking out annoying creatures could be a powerful tool, the reality is Hypergenesis is unlikely to need it. Requiring a dedication to red and lots of mana Mordant dragon may not see much play competitively. In casual and multiplayer this card has a lot of potential, big scary creatures like dragons can make more of an impact and take out multiple powerful creatures opponents control team it up with cards that make it unblockable and profit. In limited if your dedicated Red grab this card as it can end a game, while mana intensive this card epitomizes red and is a welcome addition to the Dragon arsenal. Today we have a Pojo exclusive preview card which happens to be a 5/5 Dragon with Flying, a Firebreathing effect (for two mana), and an added creature burning ability all for six mana. Not a bad addition to the tribe and certainly a threat once established on the battlefield. However, the lack of Haste or Trample, paying two for the +1/+0, and being quite vulnerable to most non-Red removal options leaves this without a home in non-Limited formats. In Constructed and Casual I'd much rather be playing Bogarden Hellkite, Hellkite Charger, or Predator Dragon for their Haste. The burning of a creature effect is nice enough when it happens, but having Shivan Dragon's mana cost with double the price on the pump weakens it dramatically as an actual finisher. Mordant is more of a support creature which is a strange role for a Dragon type in Magic and at the high mana cost can only rarely be justified. For Limited this is a bomb card and the only real weakness is the triple Red in the casting cost. Six mana for 5/5 in the air with a built in creature destruction is hard to beat in the format and should be a top pick in Booster without a second thought. In Sealed the decision is more difficult, but if your mana ratio and pool of Red cards are both solid you shouldn't have trouble fielding this by the sixth or seventh turn. Running a card like this, especially with the pump ability, I'd strongly suggest a Red/Green build for mana acceleration. The suggestion of Green is almost a given if anything in your pool is able to give Trample. With Multiplayer the key thing text that keeps this at the same level as Constructed is the creature targeted must belong to the same person damage was dealt to. Otherwise it'd be easy to attack one player with no aerial defense to destroy the creatures of another player that might have blocked Mordant's attack. This would be quite broken, so without it there are other cards that can more efficiently finish off players taking direct damage. Myuu Every set there is a dragon that you end up pulling in the first couple drafts (probably even a foil copy) during that release time where everything seems fresh and subject to change. You know, the dragon that you don't really trade because (1) no one is looking for it (2) it has some neat experimental mechanic that seems fun (3) because you kind of hope that it may be a one of in some casual or legitimate deck, even though its overcosted. You don't really feel bad about it being your rare, but its just not a chase card. Mordant Dragon is that dragon. Pull it, enjoy it and leave it in your niche folder for the rest of your magic-playing days.